Latest post Mon, Apr 11 2016 7:05 PM by Kevin Klimek. 5 replies. I've tried out everything until now, but it won't work. For a Filmuniversity project I have to sync my ProRes and WAV Files, but people on set did not do any claps or have clockits. I don't use Plural Eyes, so I don't have the chance to sync it there either. So I thought it was a good way to try out the 'Waveform analysis' from 8.5, but it appears, that our university computer has it on 8.5, but I downloaded AMC 8.5 today for me at home and it doesn't have this funktion. It looks like before, but it is the updated Version. Had to find my way through this, but now that I switched on the waveform analysis and picked the Group Clips Option it works! Thank you very much! I am doing a bit of tutorial via Skype with a junior editor. He has been experiencing the same problem. 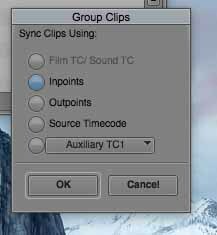 We managed to get his timelines to draw waveforms, but the option still does not show up in the Group Clips dialogue box. Strange. And the junior editor is running MC v8.5? Have they tried a new Avid user?